Rennie Law, LLC is dedicated to providing compassionate and capable legal services to our Social Security Disability and Bankruptcy clients. We are passionate about helping distressed clients get back on their feet. If you are in need of our services, please call today for your FREE CONSULTATION – (541) 414-0300. We are located at 336 W. 6th Street in downtown Medford, right next door to the Federal Courthouse. SOCIAL SECURITY DISABILITY – If you are no longer able to work as a result of severe impairments, you may be eligible for Social Security Disability benefits. Attorney, Brandon Rennie, is uniquely familiar with what you are going through and has significant understanding of the bureaucratic workings of the Social Security Administration. Please let us help you receive the benefits you deserve! Your initial DIB application. For your initial SSI application, you will have to contact the Social Security Administration (SSA) at (800) 772-1213. Your Request for a Hearing. The organization and submission of your medical records. Requesting Consultative Examinations, Hearing Postponements, Expedited Hearings, and other administrative actions from SSA when helpful or necessary. The preparation and representation of you and your case before the Administrative Law Judge (ALJ). Your case is very important to us, both personally and professionally. Please schedule an appointment with the attorney for a free evaluation of your unique situation – (541) 414-0300. Let’s get you those benefits you deserve! Chapter 7 – This is typically a complete discharge of most unsecured debts. It is the quickest and least expensive bankruptcy option. A Chapter 7, once filed, is usually resolved in a matter of a few months. To qualify for a Chapter 7 bankruptcy you need to be under certain income levels and you could not have filed for Chapter 7 bankruptcy within the last eight years. Chapter 13 – This Chapter is commonly used for people who have too much income to qualify for a Chapter 7, but still too much debt to keep up with. It also offers some very unique options that are not available in a Chapter 7. A Chapter 13 can strip a second mortgage from a home and it can reduce the value of a vehicle from what is currently owed to the current market value of the vehicle for certain qualifying Debtors. A Chapter 13 puts you on a payment plan for three or five years where you pay back at least a portion of what you owe. It requires a thorough evaluation of your case to determine which Chapter provides the most benefit for you and your family. Please schedule an appointment with the attorney for a free evaluation of your unique situation – (541) 414-0300. You deserve a fresh start! Please call today for your FREE CONSULTATION! (541) 414-0300! 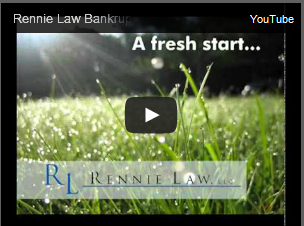 Rennie Law, LLC is a federal Debt Relief Agency, helping people file for relief under the U.S. Bankruptcy Code.